Once upon a time, in a free country, a private organisation that loves the Bible encouraged private individuals to take their own Bibles to school for their own use in free time, because they love the Bible and because they wanted to remind people that this is allowed. They aren’t old fashioned humanists, the AHA. Old fashioned humanists believed in silly things like God. Isn’t that funny? No, these are modern, clever humanists. It’s fun to call this group AHA, because “Ahaa!” is the sound you make when you’ve had a clever idea. The AHA’s friends are all very, very clever, which is why this is such a good name. Don’t you agree? Lots and lots of people came from far and wide, and they were lining up to answer. They all said very interesting things. Some of them exploded with lots of colourful emotions, like a rainbow fountain! Some of them made up interesting stories (like this one!) about how this was against the constitution, which was very funny. I think it’s nice to have funny friends to make you laugh. I know that really picks me up when I’m down. Some of them didn’t even go to school, and still believed in a thing called the “Dark Ages,” which is a story that some grown-ups tell each other. But it wasn’t a real thing. Actually, a lot of people in the Middle Ages were very bright, which is the opposite of dark! It’s very important, kids, that we remember that there is a difference between true stories and fairy stories. The Dark Ages is a fairy story, but it makes some people feel good about being different from other people. Some of the AHA’s friends were very kind. They were worried about our health, and really just wanted us all to be OK. The Bible is very old, so if you believe what it says, you might be sick. We don’t want people to be sick. Maybe we should have special Bible doctors to help people like this. Wouldn’t that be nice, kids? Some of the AHA’s friends were very naughty, and talked about rude things. Isn’t she naughty? I’m sure none of you kids would talk that way, or you would get a smacked bottom. I bet this naughty lady would like that! Some of the AHA’s friends lived in caves far, far away, and had never seen the outside world before. They thought that “war” was a meal where everybody brought a different kind of food (unless you’re in the American South, where everybody brings potato salad). But that’s not a war. That’s a picnic or a pot-luck dinner. 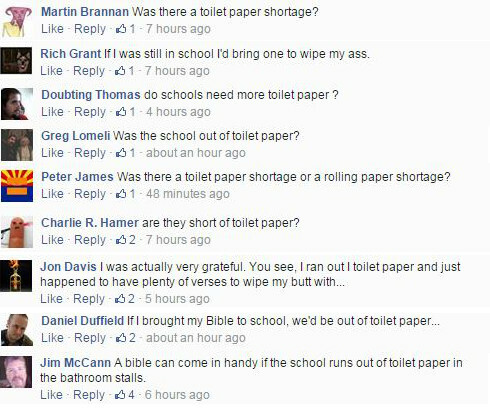 Some people wanted to share their feelings that they had about the story about school children being allowed to read the Bible in their time. So they did! Awww, Judy! I’m sure that all of us know what Judy feels like. I know I often wish I could express more hate than I can now. It’s a bit frustrating, isn’t it kids? But most of all, the AHA’s friends had lots to say about bottoms. A lot of them used a naughty word for bottoms. Your mummies and daddies wouldn’t be very happy if they heard you talking that way. But I’m sure you don’t. A lot of the AHA’s friends were very interested in poo, which was very strange. Nobody really knew why! Here is what just a few of them said. Everybody laughed at the funny jokes AHA’s friends told about wiping bottoms. No matter how many times people said it, it was still very clever and amusing. Most of all it showed that AHA’s friends were interested in accepting people who were different and not being rude or offensive. There were lots and lots of comments like this, so I only quoted some of them. But kids, if you use your imagination I bet you can think of what the rest were like. You won’t find it hard, because they were just like these comments. Go on! Close your eyes for a few minutes and have a go. After a while, it started to get late. The line of people wanting to answer the question was still very long, and there were still plenty more answers about poo and bottoms, as well as all sorts of very clever stories about mythology, fairy tales and about how bringing your own Bible to school and reading it in your free time should never be allowed in a free country. But as the conversation grew long and the sky got darker and darker, and all the lovely twinkly stars came out to shine, it started to get cold. So cold that people wanted to build a fire. But what could they use to make a fire? That’s right, Bibles! Yay! Now they could all be warm and they could stay up all night, sitting around the biblefire, toasting marshmallows and ushering in an age of science and tolerance. Some of the AHA’s friends were a bit worried that silly Bible readers might not understand all these comments about bottoms and poos and fairies, or the comments about people being sick in the head, deluded, so different that they shouldn’t come to school, and all the other funny things they were saying. You can understand why people who are a bit slow might misunderstand all of this, and as everyone sitting around the fire knew, Bible readers are a bit slow! Fortunately Athena (which means “truth,” how lucky!) spoke up to make sure that everyone understood. Actually, this is all about the fact that the evil Bible readers are so disrespectful, and the AHA’s friends respect everybody else. Being a humanist is all about respecting humans. Yay! PS: All comments shown here are accessible to the public. The Facebook page is not private. Posted on October 18, 2014 June 13, 2018 by GlennPosted in atheismTagged angry atheism, atheism, humanism, secularism. Previous Previous post: What makes you doubt? I can feel the AHA’s empathy coming through so clear. Well either these aren’t the atheists who are appealing to science and reason, or “science and reason” in atheism is just a scatological obsession. I’m inclined to believe the latter. Atheists making toilet jokes about the Bible and this equal “atheism is just a scatological obsession”. And this comes from the person who appeals to “science and reason”. Some atheists making toilet jokes about the Bible when Christians constantly try to mix religion and government in a country where there should be a separation of State and Church now equals to “sub par thinking”? Too much myopic bias in this one. That piece, as an exercise in pure rhetoric and satire, may be the most artistically ideal post you have done on this website. Well done, and well said. Nice strawman, Jon. I wonder why it is that this post is focused on the AHA and some of its followers instead of “all atheists”. Furthermore, just because you believe some Christians overreach when taking a role in governmental affairs (based on a particular interpretation of a somewhat ambiguous phrase in the First Amendment to the U.S. Constitution) somehow merits toilet humor regarding the Bible and those who take it seriously even when some subset of that group offers philosophical arguments instead of just quoting Bible verses ? Are you trying to tell us that if a certain portion of one cultural group is perceived as acting unfairly toward you, mocking and toilet jokes are perfectly warranted toward the entire group ? If you are, that doesn’t sound very humanistic to me and sounds rather like merely being nice to people who are nice to you. Indeed, toilet humor and jokes about burning this or that book is always sub-par thinking no matter which group of people is doing it. And if you don’t think what I have quoted here represents “sub par thinking,” I feel bad for you. Do you really think it’s healthy? And as for mixing religion and politics, it’s unfortunate that you think that private citizens being urged to take their own Bibles to school to express their entitlement to do so is an inappropriate mix of religion and politics. I wasn’t taking issue with that expression of freedom, nor does that comment thread provide any good reasons to do so. But it certainly provides some insight into the way some people think. Say Jon, while you’re here, what do you think of the call to burn these private citizen’s Bibles? However here is a strawman for you. You said: “based on a particular interpretation of a somewhat ambiguous phrase in the First Amendment to the U.S. Constitution”. You can read about US Supreme and lower court decision about his, so you don’t have to make your own “particular interpretation”. And it’s about Government not individual students bringing the Bible. Yes, humor and mocking rather than violence is often good approach to conflicts or unfair treatment. And yes “the entire group” of people pushing their religious books in public school should be joked and mocked about. Are you part of that group or are you part of Christians not pushing your agenda down others’ throats? Humanism is not about being nice to some and not nice to other. Read about their mission statement above. Christians have centuries old tradition of burning and banning books, and you are offended when someone makes jokes about it. It’s not like Humanist books advocate killing people or resort to name calling of people who don’t share their world view. Not my thing really. Reactionary humor against long oppression by Christian privileged majority perhaps. I think better idea would be to ask people to actually read the text that claims to be God’s immutable everlasting truth, and make your own conclusions. Jon, I think your answer reveals what I wanted to know. I quoted your remark, “Well at least we managed to label all atheists negatively” and asked for a quote to support this remark. Now as I’m sure you gather, not all atheists are involved in organisations like this, so pretty clearly this mundane observation is not a case of “label[ling] all atheists negatively,” which is what I asked you to substantiate. What’s more, I never even negatively labelled all atheists who are involved in this type of organisation. 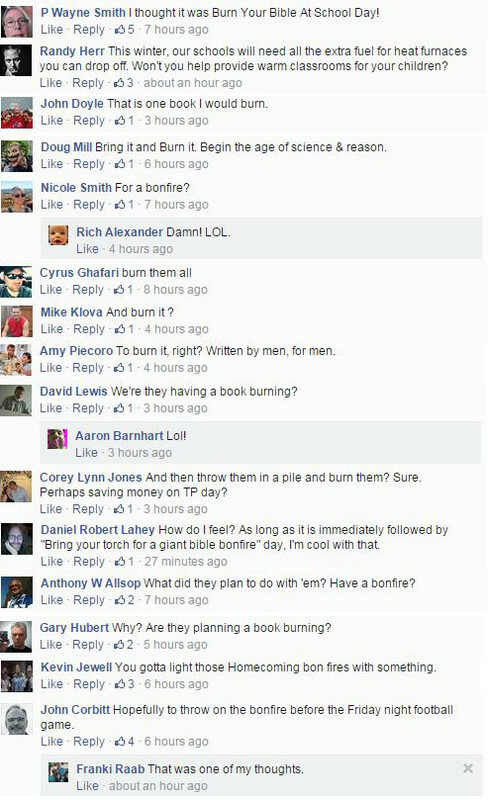 I am glad, however, that you do not actually approve of what these people are saying in their call for book burning. Apparently we both take a dim view of what was going on among the AHA’s fan base. Notice how this parallels your accusation of all atheists being labeled negatively, and it was Glenn who made the blog post about some atheists’ comments on the AHA Facebook page ? Your words here indicate, with virtually no room for doubt, that you were referring to Glenn when you made the accusation of labeling all atheists negatively. About the First Amendment’s establishment clause, I still think it is a bit ambiguous on the judicial level if you look at some cases (e.g. Justice Rehnquist’s dissent in 1985 in the Wallace v. Jaffree case). I agree with you, in any case, that the establishment clause addresses federal government instead of individual citizens, and that does away with your accusation of mixing religion and politics in this case. These are citizens urged by a private organization to exercise their right to bring their Bibles to school to read outside of class time. Nothing to do with politics here. Students are just as free to read anti-theistic books in their free time in school. The accusation of shoving beliefs down people’s throats is weak tea. This call to bring Bibles to school was prompted by a recent issue a student had in a Florida school on April 8 of this year when he was told by his teacher that he is not allowed to read his Bible in his free time. It’s not like this just came out of the blue. Even then, though, about people mixing religion and politics, you ignored my qualification of “even when some subset of that group offers philosophical arguments instead of just quoting Bible verses”. Indeed, Glenn argues against abortion, for example, by using purely philosophical arguments that make no reference to souls or anything based on the Bible. The fact that someone ultimately believes the Bible to whatever degree is beside the point in such instances. Also, you offer a false dichotomy between either mocking and toilet humor or violence. What is being asked for here is quality thinking from those who displayed sub-par thinking on the AHA Facebook page. Furthermore, I never said that secular humanist books resort to name-calling or violence, so please don’t try to imply that I said as much. Heck, I never even brought up secular humanist books. We’re talking about the absurd comments depicted in the contents of this blog post and the myriad of others just like it on the AHA Facebook page. Joe Shuah: I will personally let my kids read the bible when they can. It will help them turn atheist. Jeffrey Applin: I’m all for children being able to bring any book to school they want. Robert McLeer: It should be every day. Devon Giguere: You should have the right to bring a bible to school. You had no intention to give a balanced assessment of humanists/atheists. You repeatedly associated what Christians view negatively to humanists/atheists. (Just like how Bush always linked Iraq and WMD in his speeches – great example how propagate a view while having an excuse), and you finalised this by adding “concentration of this sort of sub par thinking” comment. This is a text book case how to negatively paint your oppositions. And now you are upset that I call you out that you did not write about humanists/atheists in good faith? So no, I didn’t believe I lied. James, yes, atheists were portrayed incorrectly (“silly” believing in God) and negatively. Read the article again and replace AHA with your church’s (Catholic, CoE, Mormon) name and see if it gives a neutral or positive view of your church or Christians in general? Such a naive view. Powerful Christian lobbies promoted this even after school district caved in to demands already. This is a lie. It was school time, in the class room, not “in his free time”. AHA did not ask “quality thinking”, just opinions. Glenn selected an article which did not ask for philosophical pondering, just venting anger. Don’t get confused by this and expect people’s great ideas in one sentence Facebook comments when they are angry. Jon, you know I didn’t generalise about atheists (or about humanists), and that’s why you are not quoting me as doing so. You’re just stating that it happened. But it never happened, and the honourable thing for you to do is to simply admit that you made a mistake instead of trying to defend it. It may be irritating to you that I have quoted the AHA’s Facebook fans in this way and made fun of them, but that’s not licence to make false accusations. You also quoted Jason’s comment, and yet you deliberately overlooked my reply to him where I clearly say that I am not generalising about atheists. So you’re just not commenting in good faith. If you genuinely believe what you’re saying about what I did, it is simply in your head. This attempt to make more of it can end now (in fact, it has ended). The thread doesn’t need to get clogged up with people trying to tell me what I said when everyone can see what I said. You said: “This is a lie. It was school time, in the class room, not “in his free time”. You’re correct that it technically is not free time, though a number of local media outlets portrayed it as such. Big caveat, though: this was during their Accelerated Reader program that already had the Bible on the list of approved books. Also, I don’t see what the location (“in the class room”) has to do with it. If he’s reading it during a lesson, then I agree he should put it away or the teacher should take it until lessons are over. Where was there caving in to demands ? Unless I’m misunderstanding this, some books of the Bible were already on the list of approved books for the Accelerated Reader program, but the teacher, for whatever reason, did not allow it. Liberty Institute simply demanded that the student be allowed to read the Bible during the time allotted because it was already on the approved list and did not get a clear affirmation of that from the school district. 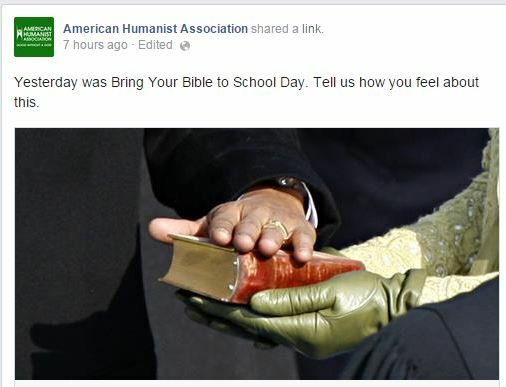 Additionally, there’s nothing wrong with a group encouraging students to bring their Bibles to school. If people want to interpret it as a giant middle finger to non-Christians, I don’t know what else to say. It’s not like they’re telling students to read it during class lessons or harass non-Christians with it. Should the students bringing Bibles get out of hand with it (e.g. mocking, insulting, condescending, etc), then they should be appropriately disciplined. As for your accusation of Glenn performing some rhetorical sleight of hand, he’s already amply dealt with that. If my church made a post like the AHA’s and a large number of people made comments like the ones we see, I would indeed be shocked and wonder why my church attracts people with such absurd sentiments. Regarding the folks you quoted, there’s already no doubt that there are secular humanists and atheists that agree with the right for students to bring their Bibles to school. That was never in dispute from myself or Glenn. Please, Jon, will you tone down the rhetoric and polarization ? I think that this is a problem for both sides in the culture wars. Either side has some legitimate gripes here and there, but I don’t see how getting caught up in either extreme is helpful. Is public Bible reading such a terrible threat to democracy and reason? Or do some people just have a visceral (perhaps spiritual) defensive reaction to it?